The moment I decided my 100th post was nearing, I knew I had to write something about I love the most and it didn’t me take long to figure out what it was. 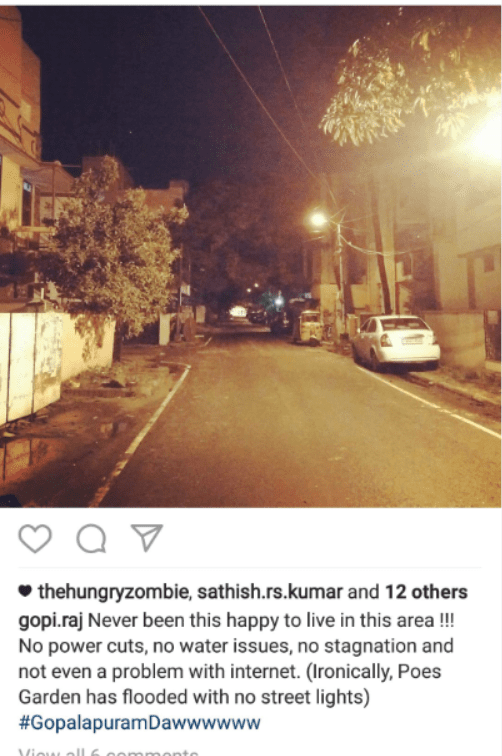 Chennai is more than a hometown to me. 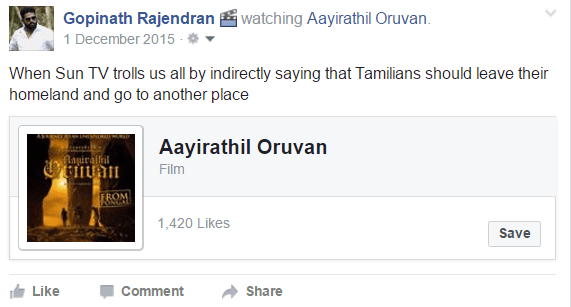 Just like how I stood out as a proud Indian away from my country, inside it, I’ve been been a Tamilian and Chennaite. Ever since day one in the last 26 years, I’ve stayed 5 years away from the city and another five much further than that, and just like how they say you’d miss something when it’s not with you, I missed my city as much I missed my mother. In spite of having my uni mates living next to my university in London in a dorm, I decided to live in East Ham, an area in East London that’s got a huge Indian population. I still remember the days walking down the foreign streets wearing a ‘You can take me out of Chennai but not the Chennai inside me’. And when I got back for good, more than the content of seeing my family and loved ones, I felt complete, some what similar to Han Solo saying the words, “Chewie, we’re home”. And my love for this beautiful city is something that personifies me and vice versa. Even my blog stands as a testimony for this. So when something which wasn’t supposed to happen happened, I couldn’t sit back and ‘pray’ things to get better. The annual North East monsoons loved my city a bit too much last year and it ‘showered’ Chennai with a tad more affection than called for. November had the first wave of rains and while it covered most of the area in a concern-able level of water, my area was dry as a bone. 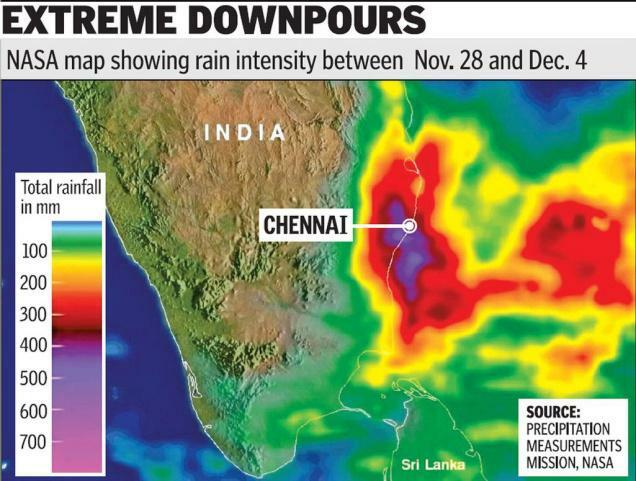 Then we got to know about the so called El Niño which was on a collision course towards Chennai. It was the wettest November in a century in the city of 4.3 million people. And, at 490 mm, rainfall on 1 December was the highest in 100 years. With the Chembarambakkam lake opened due to it capacity on the verge of getting fulfilled, it didn’t take long for the Adyar river to get violent. Following that, the city got flooded in no time. Here’s a video which explains how it all happened. The first day of December is when the news of a couple of areas getting flooded hit the headlines. Even then, very few local channels were focusing on it while the other ones were busy playing films. And obviously, we guys were trying to find the lighter side of things. With my area yet to be affected, I did as much as I can, trying to help those who were stuck. Those who know me, know that I’m a part of the admin team of Where Chennai Eats, the second largest Food Group in Facebook in India. 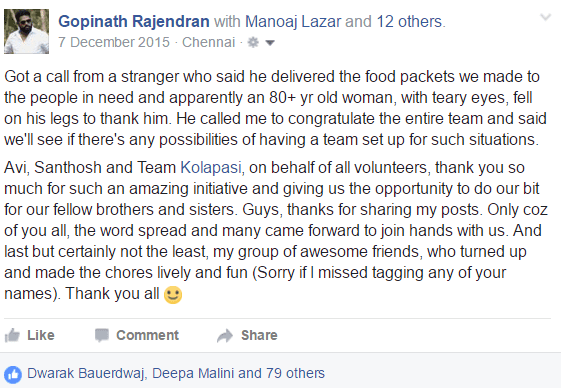 Usually it’s a site where we share our views on restaurants across Chennai but right from day 1 of December, the page went into a different mode and with 70k+ members (now with 113k), the page was an excellent source of info for volunteers and those who needed help. By 2nd December, the Chennaites took matter into their own hands and set out to sort things in every little way they knew. 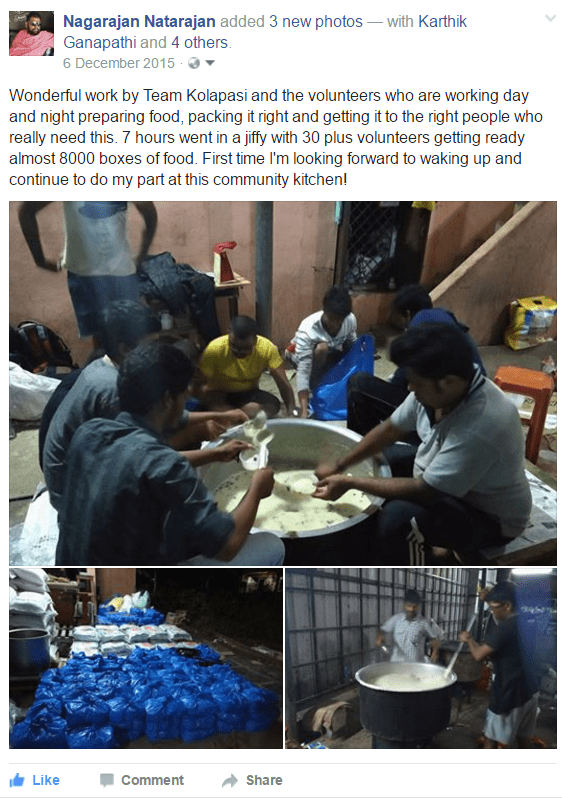 A well known person of the city and someone whom I know personally as someone who’d step up to help others, Sam Paul, made his house a one point source for collecting clothes, blankets and other basic requirements and also as the point of contact for volunteers. To do my part, I loaded my car with whatever I could fit and left to pick a friend in Anna Nagar. Misjudging the level of water in the street and being over confident of my car’s ground clearance, I got stuck in my car which was flooded till the gear knob in a matter of seconds. Humanity came to support when I managed to climb out through the window and waited for someone to help me out. An elderly woman and her daughter who saw my state from their house balcony shouted if I needed help and offered me shelter inside their house till I get some help. Mind you, it was a house with just an elderly woman and a young girl who were ready to accommodate a man. That’s an incident I remember whenever someone says ‘Humanity is dead’. Fortunately, 4 people who were wading through the waters were kind enough to push my car back to dry land and obviously, my car conked out on me. After pushing it to a nearby ATM which was closed, my friend and I managed to get hold of an auto who asked for Rs. 200 for a one way trip from Anna Nagar to Kilpauk. For those who don’t know how far they are from each other, it’s less than 4 kms. After explaining to him who we are and why we have so many bags, we woke up the quality of benevolence in him, following which he agreed for a much lower fare. We a Sam’s place and met a couple of youngsters who were doing their best to save those who’re in trouble. After dropping our bags, we realized we got to get home. My friend fortunately got a lift from a car that was going to his area. The less fortunate me decided to walk as much as I can hoping that I’d find some form of transportation. Unfortunately, I wasn’t as lucky as my friend and I covered the 6 kms distance by foot. I stopped by at the halfway mark in Nungambakkam for a cup of hot tea, my first ‘food’ of that day. That’s right. After getting back to my area, I was shocked to see water flooding my streets which was at shin level and in no time the water level rose. While my house in the main road was fortunately high enough that only a meager amount of water entered the ground floor; the other houses, especially the ones in the streets weren’t that lucky. After getting a earful from my father for what happened to my car, I got back to the streets where I met my area friends. We decided to make sure our homes were stocked with basic amenities, so we we headed towards Gopalapuram (another long stroll), where we saw one supermarket that was raided by folks. To our horror, we saw people fighting for milk and bread packets. After getting whatever little we could and also making sure the women who weren’t able to fight with the men that were trying to take more than what’s required, we got back to our area. By this time, the night was out and electricity wasn’t a luxury we were blessed with. 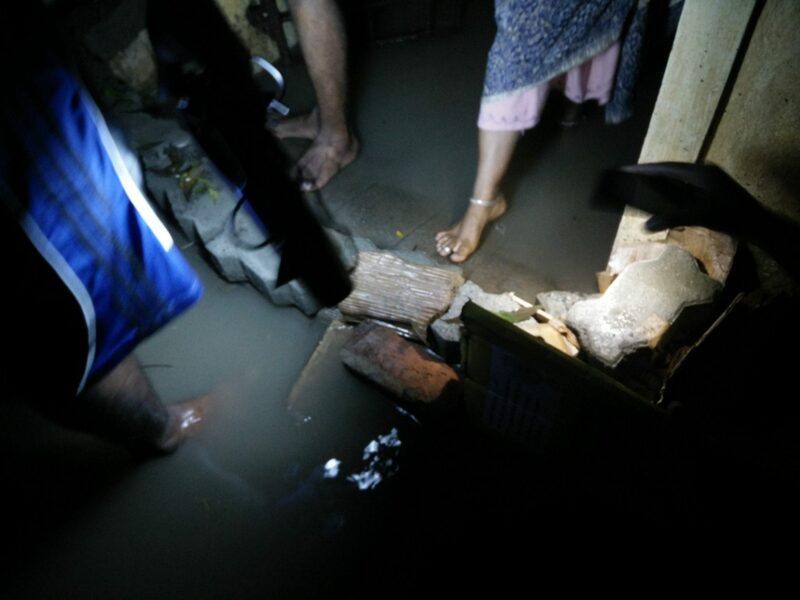 We figured out that the water level was rising much faster than we had anticipated and gathered whatever we could lay our hands on and started doing our best to prevent water from getting inside the houses. 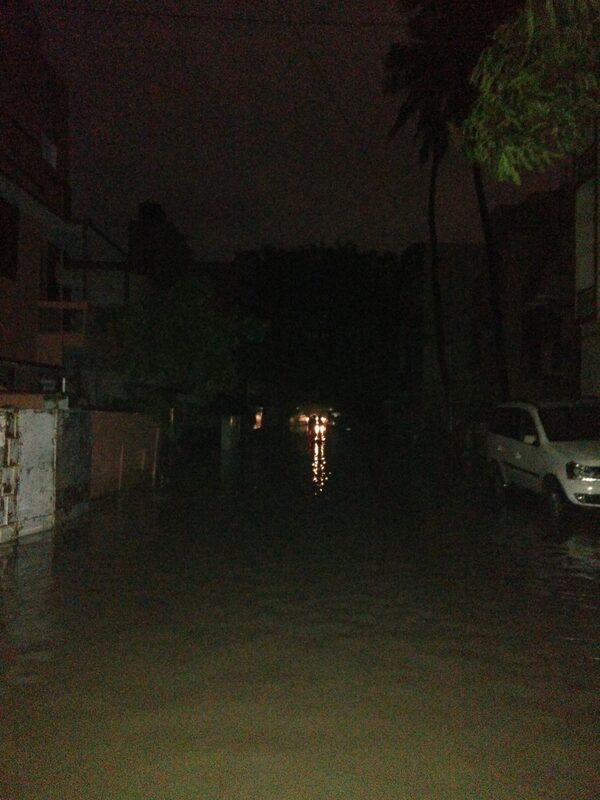 It was yet another terrifying night with people worrying whether the water will subside. Power was running out from all the electronic devices and the lack of communication only made way to more commotion. Many people, who weren’t able to get to the streets and help did the second best thing – be online and guide those who were doing the ground work. Many online influencers such as my friend Muskaan, who have a great number of followers on social media took to Twitter and Facebook from where we got news on what’s happening. The best part about this was the fact that we also got to know where the issues got resolved so man power wasn’t wasted. And so we managed to crawl into the 5th of December. Apart from the fact that it was my birthday, I was happy with the developments happening around me. The city was still flooded but people were getting rescued, volunteers were working non stop, even celebrities took to the streets to help others. I decided to make use of myself and tried figuring out which place would need my help. 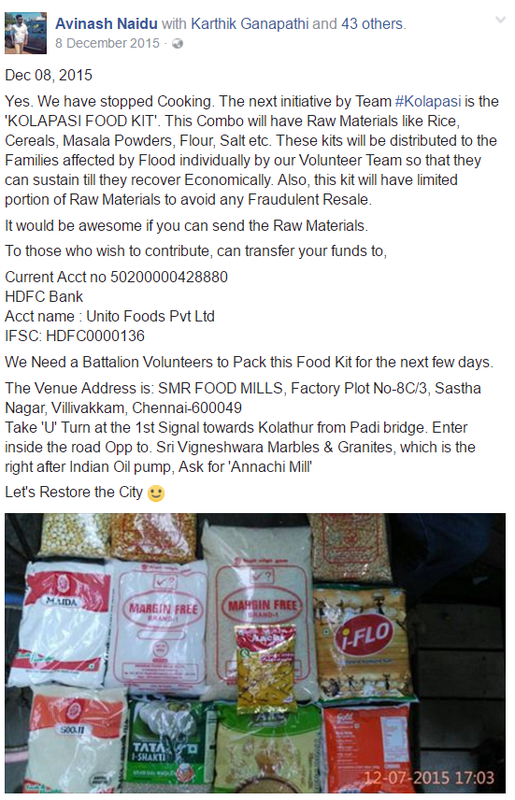 I found out that volunteers were needed at a so called club in one of the most famous areas of Chennai. I reached there with a friend of mine as fast as we could but all we saw were a couple of tee – and – shorts clad elderly uncles who’d give a run for the regular armchair critics. They told us to wait as the things are yet to reach the club premises. We waited for close to a hour and we lost our patience on waiting for something which took ages to come. 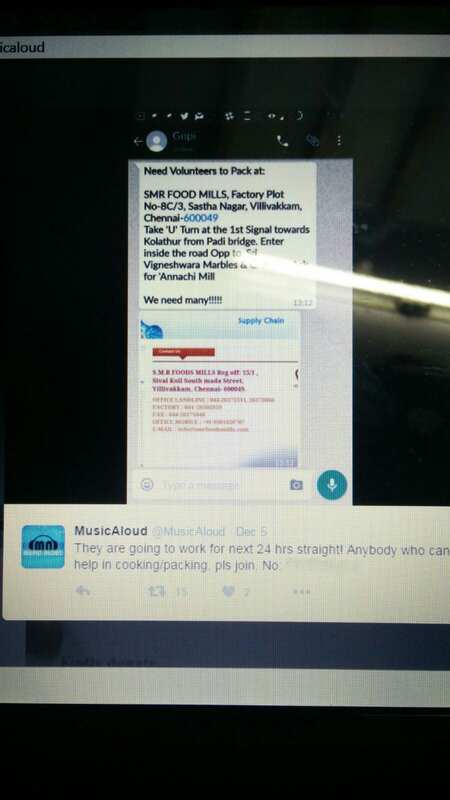 But since that area got flooded as well, they moved to a mill in Kolathur. 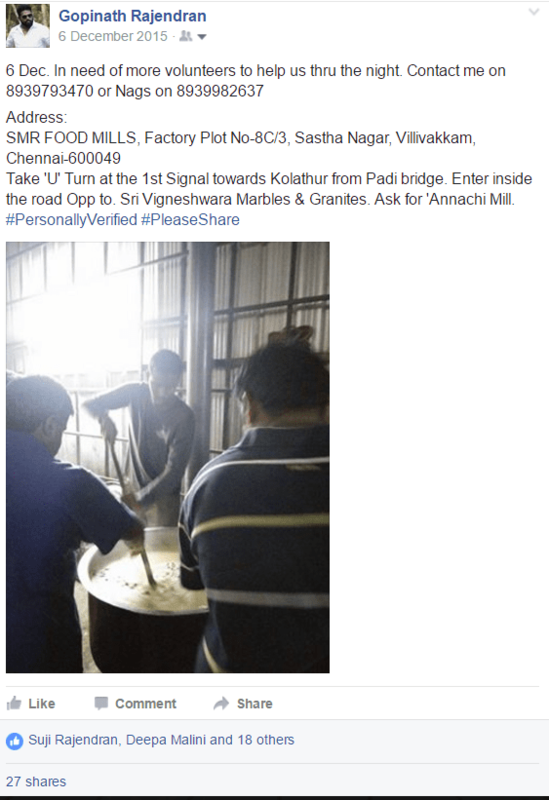 The owner of the mill was kind enough to open the doors to their premises and use their raw materials at a discounted price to help cook and serve the needy. We reported at the place in no time and work was happening briskly. We got ourselves busy with things and started helping with the cooking and packing respectively. The food was extremely hot and packing them up in plastic boxes was a challenge that’s easier said than done. The above post, shared from my FB profile became viral in no time and thanks to Twitter and other social media platforms, my phone didn’t stop ringing. It also showed me how valuable a single percentage of phone battery charge matters. 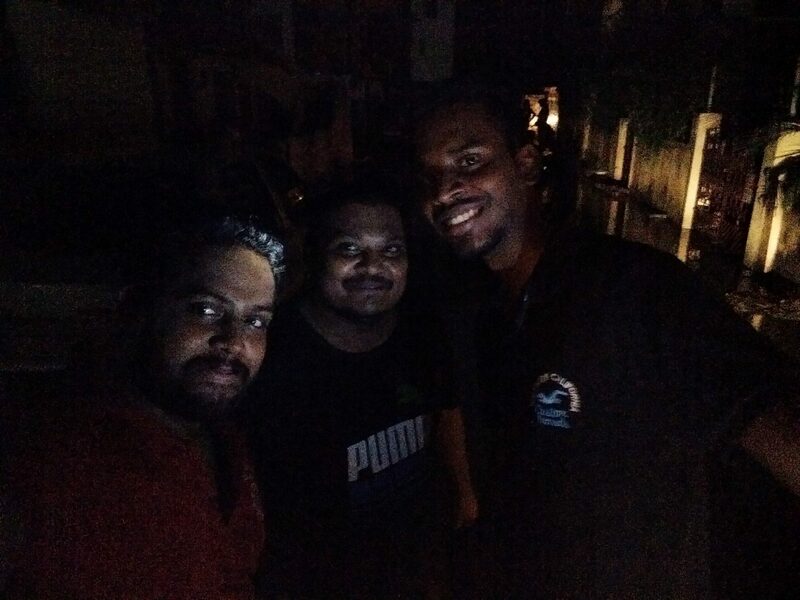 When I realised Santhosh has been doing this day and night for more than 48 hours, we sent him home and a couple of us took charge during the night. Cars after cars came and picked up food which were served to those who were saved and also for those trapped in their houses, safely but without food. We went throughout the night and early morning, I decided to got back home. It was a birthday worth remembering forever. With barely a couple of hours of sleep, I reported back at base and this time, it was with my gang of guys. We were making and packing food at a break-neck pace. This time our voice was much louder and we had a larger crowd ready to volunteer. 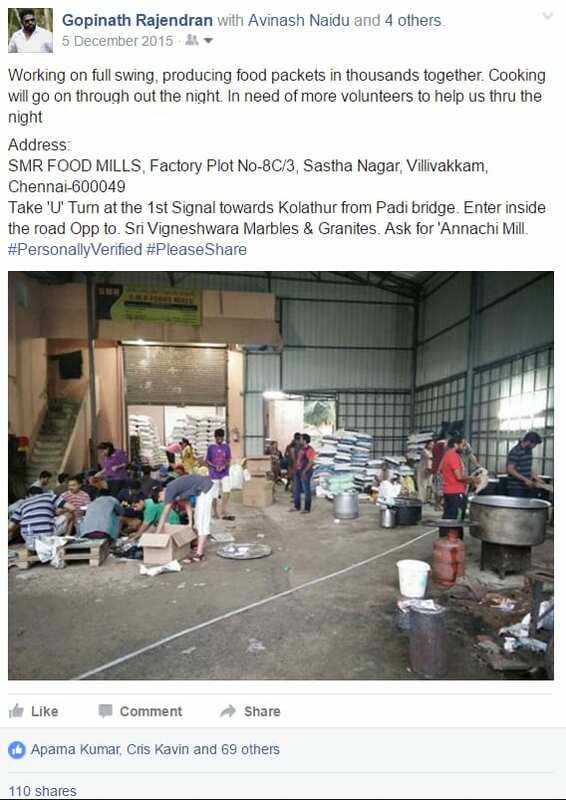 Food was made in higher quantities at a remarkable speed which were also packed and stacked according to the orders we received from trusted source. Apart from this, we also received essentials such as water, biscuits, other eatables along with consumables and toiletries. They were coming in from all districts of Tamilnadu and neighbouring states without getting caught by the infamous ‘sticker boys’. Fortunately, we had the manpower to sort out these products without disturbing our food production line. In spite of the late hours, ladies were working non-stop and after midnight, we made sure we dropped them home too. Here are a few pictures of our folks in action and those who volunteered to deliver the prepared food to the masses. Just like the day before, cooking continued through the night and we were exhausted yet contented with the results. The reason being that we cooked more than what we did the day before. Here are more photos of the guys in full swing late into the night. Some things that happened during those nights are unforgettable. Such as the random chap who had his car radio on for hours which played some all-time Thalaivar hits. And if that didn’t give us the boost to work harder, nothing would’ve. The last day of us together actually became the last day thanks to the fact that the water started receding. The Government which took ages to react was taking control of the affected areas by this day. Army was rescuing people and we all know how good they are at handling such natural disasters, so that made us breathe a sigh of relief. Here are some snaps from the last day at the mill. I was also contacted by the ILC Tamil London, one of the best international Tamil FM channels in the U.K to update on the situation. It was one of those moments that made me wonder how International media were more concerned about what was happening than the so-called famous National news channels. The after effects of the rain did leave a scar in many of us but so did the help done by many unknown brothers and sisters of my land. Here are some of the people/organisations that I know whose help played a major role in getting the city back to its feet. Apologies if I miss any names as this is completely based on what I saw and experienced. I’m sure there are many more who deserve their names to be mentioned. Actor Siddharth and RJ Balaji, who, instead of staying at the comfort of their homes, took to the streets and made a group of volunteers who did wonders. So did actor Gautham Karthik and actress Priya Anand, with whom a close friend of mine worked, was apparently blown away with their helping tendency and down-to-earth character. Many celebrities also donated monetarily. Theatres/Marriage halls across the city that doubled as accommodation for those who weren’t able to enjoy the comfort of their own houses. SPI Cinemas (Sathyam theatre) and AGS Cinemas in specific, did a great job. 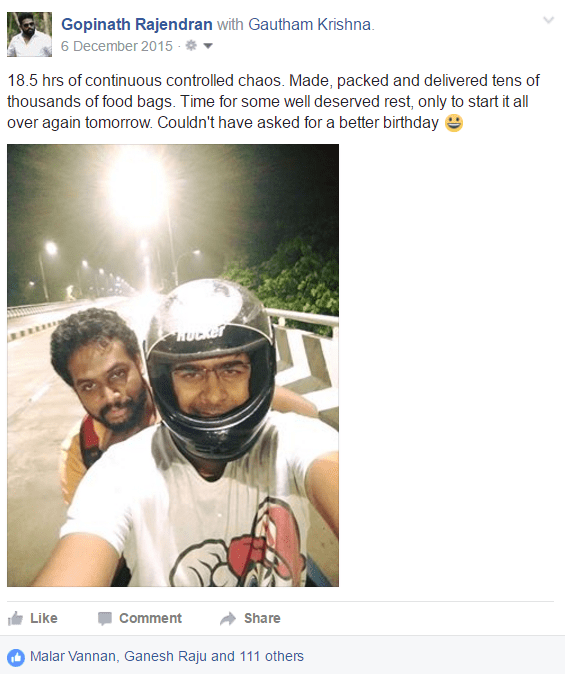 My old time friend and school mate Shashank Ravi, one of the most famous personalities of Chennai’s FB scene, who, in spite of being in the US, sacrificed sleep and updated statuses which kept us on our toes. Many of these social media influencers were, in my opinion, the unsung heroes of the scenario. Those living in the other districts of Tamilnadu, people of the neighbouring states, NRIs and those living outside India, who provided monetary and materialistic support which restored the lives of many and the faith in humanity. 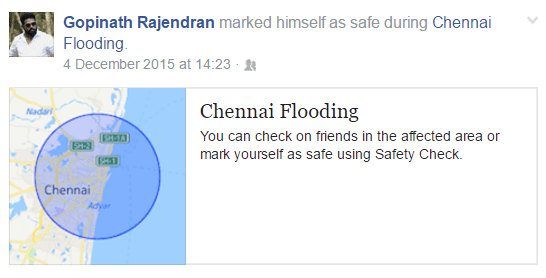 Facebook for enabling the ‘Safety Check’ feature which made it easy for us to mark ourselves as safe which was helpful in many ways. Twitter for being the platform used by influencers to update, track and help those in need. With phone signals down, the internet was a saviour in disguise. Knowing where and with what to provide help enabled the common citizens to go out and volunteer in large numbers; so much so that an army official was quoted saying that this was the first time he saw more volunteers than people who needed to be rescued. They also helped in coordinating rescue efforts between the volunteers, most of whom were common people with no prior volunteering experience, the NDRF and the army. Due to this effort more areas got covered with timely rescue and delivery with the most-needed materials. Skype announced free International calls to landlines and mobiles in Tamilnadu. Google posted a link on its homepage called ‘Resources for the Chennai Floods’, providing details about relief camps and updates on the situation in the city; it also enabled its Crisis Response tool. Telecom operators including Vodafone, Aircel and Reliance Communications offered free benefits to customers. Real estate portal Commonfloor.com created links on it’s company website for people who needed shelter or wanted to offer shelter. Mobile healthcare startup DocsApp, provided free consultation with specialist doctors via mobile. 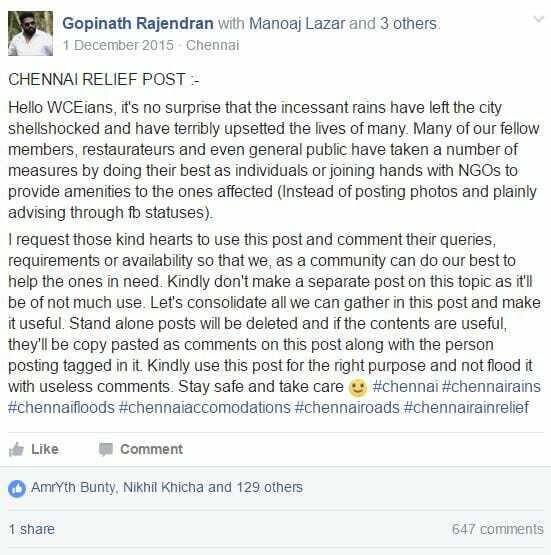 Pages such as Chennai Rain Relief which provided basic tips on how to rescue people and lists of do’s and don’ts. 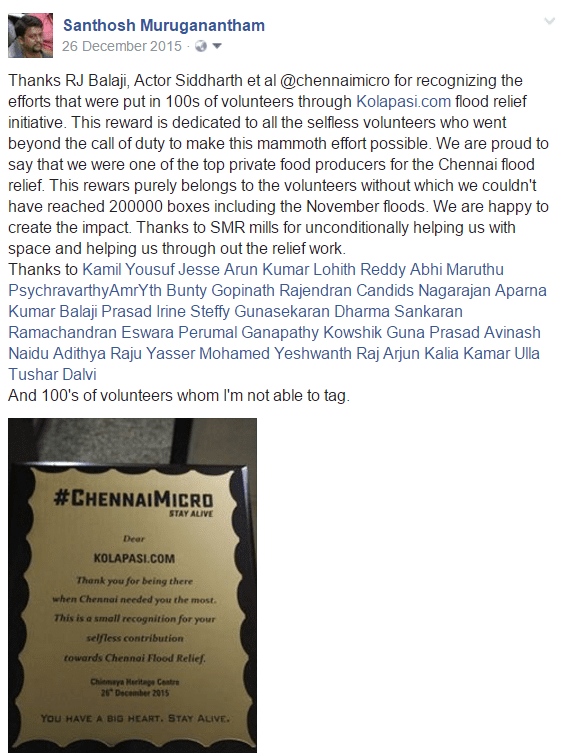 The chennairains.org site for maintaining a google spreadsheet listing help-line numbers, aid offers, rescue requests, medical camps, volunteer details and accommodation details, which was widely shared so that people could fill in details or provide necessary information to volunteers. Members from the Blue Cross of India and other online groups and associations who helped in the rescue of many stranded animals. Apart from providing medical care and temporary shelters, they also helped unite pet owners with their estranged pets and find homes for the homeless animals. Being an angel during dark times such as the recent fiasco with the whole demonetisation scene, Paytm was helpful in fund transfers between accounts. 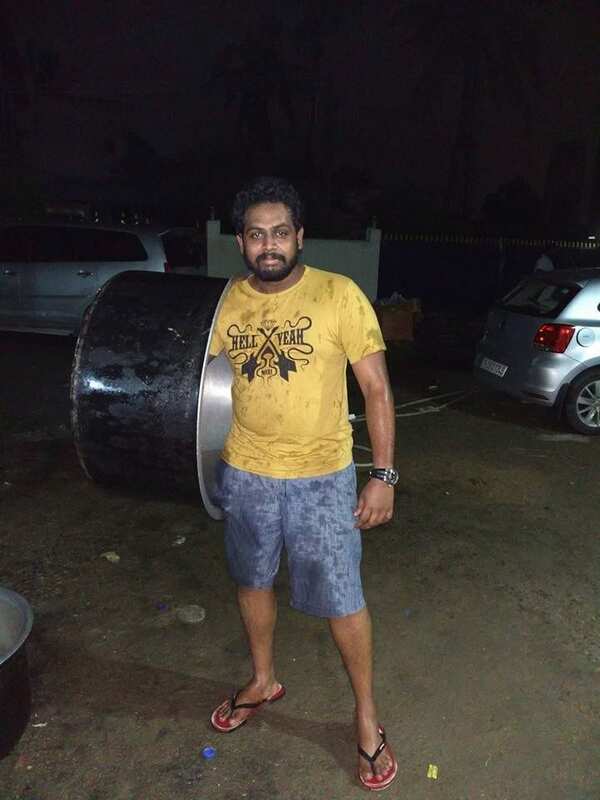 Pradeep John, a weather blogger who is now famously known as the Tamilnadu Weather Man, whose forecasts on the weather helped volunteers plan things in advance. A number of trusts and NGOs that helped in sorting out the livelihood of those affected. Restaurants were cooking food in bulk and serving it for free in their locality. Some of the restaurants that I personally saw doing such deeds were Prems Graama Bhojanam, Maplai and Crimson Chakra (despite the fact that its owner and his family were stuck in their homes which had its entire first floor submerged). Websites such as Zomato, which facilitated in getting help from those who were away from the city. The website accepted donations which were used for providing food for the needy. The Tamil Nadu Government, though was late in reacting to the issue, provided massive relief and coordinated rescue operations. The Indian Army. What Batman is to Gotham is the Indian Army to the whole of India. Enough said. The Indian Air Force who used choppers to rescue people and provided relief materials to those stranded, and the Indian Navy who also moved in for rescue and relief ops. The Chennai City Police who went beyond their call of duty and proved once again why they’re the best in the business. Last but certainly not the least, my fellow volunteers, who braved a number of things including the responsibility of safeguarding their own family, to come out to the streets, do manual labour, get their hands dirty (literally), get drenched in rains, submerged in neck deep water in order to reach those stuck in houses, cook and pack food which were hot enough to create considerable damage. Not to mention the help from kind hearts who opened their doors for strangers who needed a roof above their heads, cooked for neighbours, helped in rescue missions and did their part as fellow citizens and human beings above all. Wherever there’s good, there’s got to be evil and in this case it was shrouded in different masks such as cheapness, greed, inhumanity, immorality and many such forms to cover their sorry faces. The politicians and their sidekicks (read as allakais’) who, instead of helping the volunteers, argued, fought and stole food and consumables from them for their personal use and donated the rest under the context of it being sponsored by their party and its pillars. 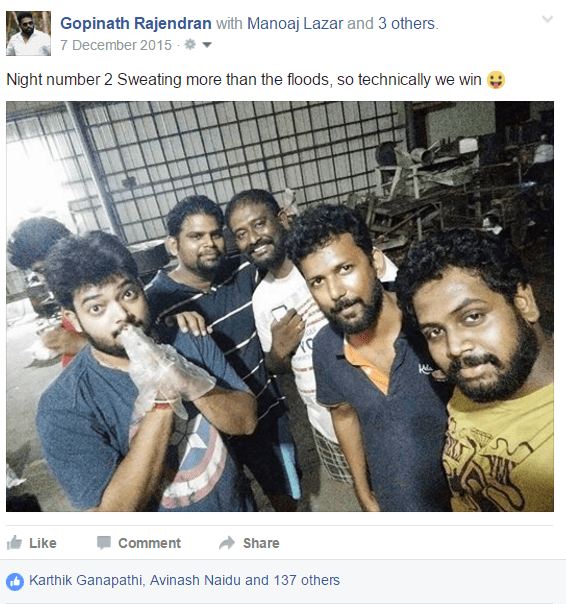 The much talked about sticker boys, who were disrupting the flow of support from other districts and states by posting stickers of their leaders on the relief material for the same above mentioned reason. The low lives who were making use of this scenario to their benefit. The biggest looters were the airlines. With the airport functioning affected big time, tickets from North India to Bangalore were costing a whooping Rs. 42,000. If the upper middle class people were robbed that way, the rest weren’t safe either. Houses were plundered by those who took advantage of the situation. Vendors who tried making hay while the sun was shining by selling products such as candles, milk, breads and other necessities at an inflated price. It was so hard to arrange for food and water but alcohol was something that people had access to. Watching drunkards create ruckus was something that many volunteers were fed up dealing with. To make things works, there wasn’t a dearth of idiots who harassed a couple of female volunteers who braved everything and worked round the clock. Attention seeking celebs who made sure that everything they did was well documented. A famous actor was going across the city with a cameraman alongside him, who made sure that the actor’s ‘deeds’ were captured perfectly to be used for obvious reasons. A famous Bollywood star who was stranded in Chennai, managed to irritate the already over-working hotel staffs by demanding facilities for him to reach Mumbai. After going through a lot of trouble, the hotel managed to get him to B’lore from where he left home in a chartered flight. Ironically, this star was a part of the video song which had many other actors from the South. National media outlets that covered the disaster poorly. As always, they were busy with following the happenings of Bollywood, arranging debates where the journalist himself would be talking (and shouting) most of the time, twisting the statements of their least favourite politicians and telecasting soaps in which the mother-in-laws are in their early 30s while the daughter-in laws will be barely teenagers. Encroachment, ineffective water drainage system, creeks and culverts that are blocked due to excessive dumping of garbage as well as the administration’s failure to ensure timely desilting were cited to be other major reasons for the flooding. As always and as expected, things returned back to normalcy and as the waters left the houses, people filled the void. Many were thoughtful enough of what would be running in the mind of those affected and the steps were taken for them to recover with ease. Relief kits were provided which had the basic food ingredients to help people resume their everyday lives. With days spent in sorrow and grief, messages such as the one below stamped a smile on our faces. When things settled, a number of groups/organisations were recognised for their efforts and I was more than happy to be a part of team Kolapasi whose selfless actions helped thousands of people. Here’s a video of Santhosh talking about the great deal of effort that had gone behind the scenes. Below are some of the photos that captured the real ordeal and the intensity in which the people of my city were affected. The Chennai Floods is a gory reminder on how we’ve failed as as a society in safeguarding our environment. But some mistakes are rectifiable and whether we can turn out to be better that what we are rests in the actions of the common man along with the society he’s a part of and the government he votes for. Despite the billions worth of damages and numerous deaths, the disaster has instilled a number of qualities that lacked majorly. A city is nothing without its people and the mind set and the samaritanism of its people define the culture of the land. The floods have reconnected us with nature, the people around us and most importantly the inner us. I’m pleased to know that my benefaction is a tiny drop in a humongous ocean of help received from thousands of folks who contributed to bringing the city we love back to its feet. As a Chennaite, I’m prouder than ever to state that I’m from the city that resuscitated itself when nature showed its ugly face. Come what may, with humanity within us and a lovely bunch of people around us, nothing can be against us. And oh… Happy birthday to me 😀 !!! Your dedication and commitment is awesome and your birthday is a turnover for good things ahead and for self realization…! Applauds ! Thanks a lot Suji 🙂 I still remember u doing your part even though u were in C’tore. Thank you for that !! !